For the time being I will moderate "Comments" on this Blog. That means that any "Comment" posted will be approved before showing up on the site. Too much spam and too many long-winded posts from anti-Catholic trollers who think they are so important everyone should drop what they're doing, study their private interpretation of Scripture and spend days accommodating them with long responses to their innumberable questions — and they want it right now! These people are bores. They tend to have no joy, no humor, no patience. They are a waste of time for me and my guests. But, I used to have lots of time on my hands to respond to every anti-Catholic, and "James-White-wannabes", but such leisure is no longer my fare in life. You can read many of these responses on my site at www.Catholicconvert.com > Resources > Writings > Steve's Writings. I encourage good discussion for edification and learning and fun! 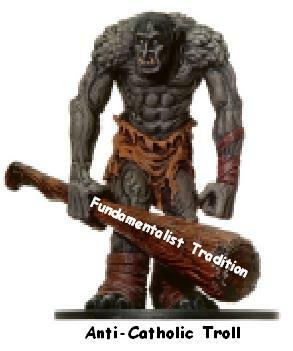 But, there are trolls who just love to find open Catholic sites to swing their Fundamentalist Tradition cudgels. They might call it evangelizing Catholics — others might call it rude intrusions. These pontificating bullies get old fast. Oh, they will huff and puff saying that I am censuring them. Well they're right, I am. They can howl that I am not being fair. Let them gnash their teeth. I notice most of them do not leave "Comments" open on their sites but they will accuse me of being against open discussion. Let them troll other sites. I have no time for them. For all you non-trolls :-) please feel free to leave Comments and I will approve them in very short order. Thanks for understanding. For those who still want to have long arguments with people who may have more time to deal with them, they can visit my Discussion Forum at http://forums.catholicconvert.com. So, I am not a prude! I DO offer a forum for lots of heated theological discussion and argumentation. That is a much better forum for such discussion than this blog. Hi, Steve! I am hoping to make it to our diocesan Eucharistic Congress this year (Diocese of Charlotte, NC). I understand you will be speaking there. I can’t wait to hear you!! Boy, you’re not kidding. I just went 37 rounds with some troll on YouTube! I don’t think I’ll do that again! I’m exhausted and I don’t think we really got anywhere!